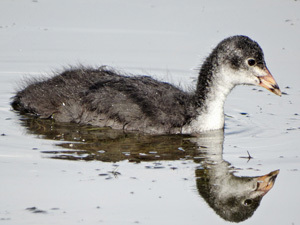 Note the light underside and bill colouration which distinguishes this juvenile Coot from a young Moorhen. The adult Coot is a dark sooty grey bodied water bird with a black head and white bill. 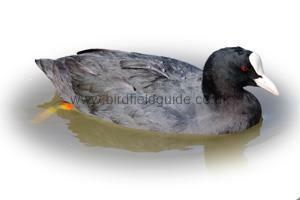 The Coot has a distinctive white frontal plate and a plump broad body. Common breeder, resident in the UK. Birds in Winter tend to form large flocks, sometimes numbering several hundred. During Summer they are much less tolerant of others and become fiercely territorial. Lakes, ponds, and other open freshwater. Can be shy but in some areas can become very bold, feeding with ducks in public parks. Usually nests out in the open on a floating nest of dead reeds anchored to marginal vegetation. The Coot is an aggressive bird often seen fighting with each other during the breeding season. Coot often run across the surface of the water whilst flapping their wings, especially when attacking intruders. The Coot dives for it's food and frequently surfaces with large clumps of water weed. Adult Coots feeding fledglings near the nest.. The original ugly ducklings! Copyright of bird field guide.